On 14 January 2010, Dr. Charles Bentley, professor emeritus of geophysics at the University of Wisconsin-Madison and executive director of Ice Drilling Design and Operations, was the guest speaker at a Wednesday session of the “South Pole Sunday Science Talks” in the galley of the new South Pole Station, where he presented a slide show of his first trip to Antarctica. In 1957, he and several other scientists set out on an expedition across West Antarctica in tracked vehicles to make the first geophysical measurements of the ice sheet. 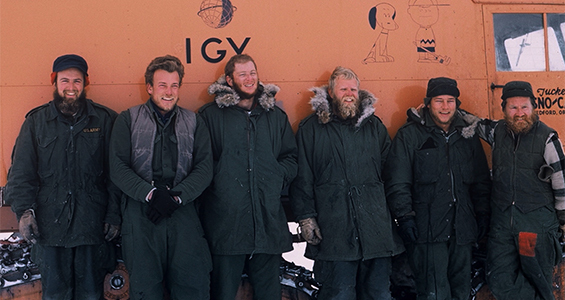 Dr. Charles Bentley (far left) and some of the Antarctic crew. His 25-month study was a part of the International Geophysical Year, a world-wide scientific project exploring a wide range of Earth sciences. Charles Bentley’s first trip to Antarctica was in 1957 and his most recent in 2010. Over the past seven decades, Charles Bentley has conducted studies of glaciology and geophysics in Antarctica. Editor’s Note: This video of Dr. Bentley’s presentation is an hour long and evidently the sound recording facilities in the galley at the South Pole aren’t the best — however, this is highly recommended viewing. 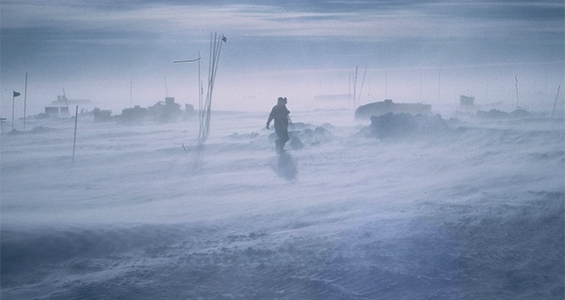 Traversing Antarctica over 55 years ago as told by the scientist who did it. Settle in with a warm beverage and enjoy the journey!